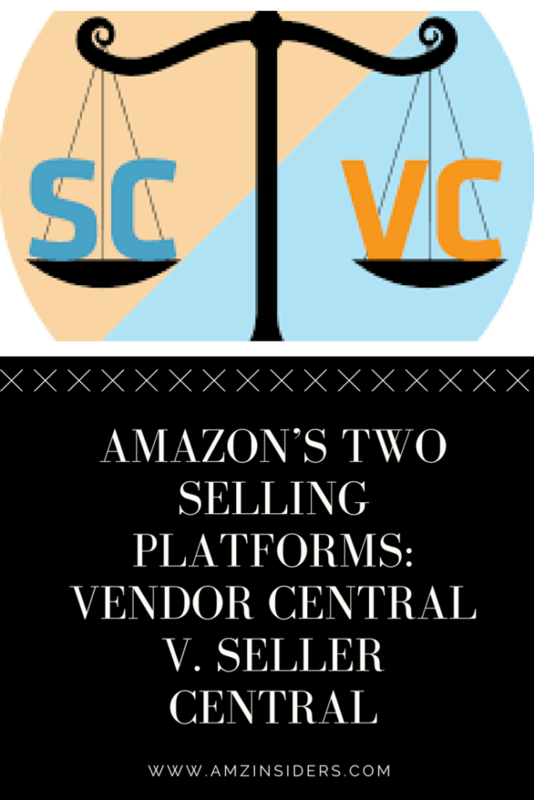 There are two main options when it comes to selling on Amazon: first-party (Vendor Central) and third-party (Seller Central), and if you plan on using Amazon to sell your products, the different qualities in these two platforms is something you need to know. In this blog post, we’re going to break down the differences between first-party selling and third-party selling. Although they are very different in functionality, one is not better than the other, but one might be more fitted for different purposes and goals. With this information, you should be able to decide which platform is best for your business. The first is Amazon Vendor Central – the first-party platform. These are the product listings that say, “Ships from and sold by Amazon.com.” On this platform, the vendor has a direct relationship with Amazon via weekly purchase order fulfillment. Amazon will purchase goods at a wholesale cost and will gain full control of the selling process. Essentially, you’re selling your products to Amazon who will resell them to their customers. It’s important to know that this program is invitation based only. Once approved, the seller must agree to Amazon’s Terms of Business, which include four main elements: Base Accrual, Damage Allowance, Freight Allowance, and Payment Terms. These terms have accompanying fees are important to know and should be considered before agreeing to them. The terms are pretty self-explanatory, but just in case, we’ll break them down. Base Accrual is a fee to cover the PR and promotions that will help sell your products. Amazon is responsible for creating these promotions. Damage Allowance and Freight Allowance are pretty much what they sound like. They cover Amazon in the event of damage to items and the overall shipment of products to the warehouse. The last aspect to be decided as part of the Terms of Business are the Payment Terms. Amazon pays vendors on a variety of schedules: Net 30, Net 60, and Net 90. Essentially, this means that you can either opt to be paid every month, every other month, or every three months, and those who do choose the Net 90 schedule are usually offered a 2% discount for doing so. Once the terms are agreed upon, the shipment of wholesale items is then sent to one of Amazon’s many Fulfillment Centers. From there, Amazon will handle the marketing, storefront, and shipments, fulfilling orders and maintaining communication with the buyer. It’s probably no surprise, but first-party typically outsells third-party. Vendor Central has greater potential to sell at higher volumes. If your products do sell enough to create an ongoing customer demand, you may be eligible for the Direct Import Program, which means Amazon will order cargo ship-sized orders directly from the manufacturing location, bypassing vendor warehouses and saving time. It’s a considerable opportunity for those catching the attention of the Amazon buying team. On top of the PR controlled by Amazon, there are a great deal of marketing opportunities available to third-party vendors, to include: AMS (Amazon Marketing Services), A+ detail pages, vendor-powered coupons, lightning deals, and Amazon Vine (product reviewing program). Clearly, there are a lot of perks to this style of selling through Amazon. So, what are the costs? On top of the wholesale cost of goods sold to Amazon, the company also charges those Terms of Business fees as discussed above. These terms are deducted monthly from the payments made to the vendor. The Amazon Vendor Central is best suited for brand owners and manufacturers themselves, especially those who wish to create a relationship with Amazon. On the bright side, the business is stable and there aren’t any customer service headaches to deal with. However, vendors must be ready to hand over control to Amazon without any communication with or data on the customers. The other option available to sellers is Amazon Seller Central— the third-party platform. On this platform, Amazon acts as the virtual storefront through which the vendor is able to sell their products to Amazon’s customers—for a fee, of course. The listing will usually state that the product is sold by a third-party seller. There are actually two types of Seller Central programs: marketplace (which we’ll discuss more below) or Fulfillment by Amazon (FBA). FBA works a lot like Vendor Central where Amazon manages distribution, but the fees are higher. As you might suspect, in Seller Central, the seller has more control over price, promotions, inventory, and customer service on this platform. With a user-friendly interface, you are able to list your items on Amazon at a retail or promotional price and fulfill the orders independently. For those vendors who appreciate the ability to gather customer data and communicate with the buyer, this platform is a good option for you. But be aware—this route requires more consistent work on the seller’s end, fulfilling orders and answering customer inquiries on a regular basis, and in a timely manner (24 hours or less). Failing to do so will result in a negative mark on your Seller Central profile with Amazon, and they can be known for being very strict this. The fees for this platform range from 6%-20% depending on the product category and are deducted from the retail price, paid to the vendor every two weeks. In addition to these fees, the vendor also pays Amazon a $40 monthly listing fee. These two platforms are vastly different and are best suited for different pursuits. Consider first the needs, future, and goals for your business before deciding which platform is right for you. The major different comes down to who will be doing the selling. Decide on the amount of consistent work you’re willing to take on, how much control you’d like to maintain, and the cost of business you’re willing to pay. Answering these questions will help you to make the right choice when it comes to selling on Amazon. We hope this post was helpful to you. If it was, be sure to SUBSCRIBE to our blog to be the first one to get notified when we publish a new blog post.